Whatever your fancy, you’ll find it in our spirited small towns and in the hustle and bustle of our promenades, galleries, restaurants and wide open beaches. Come on, let’s go play on Oregon’s North Coast! What comes to mind when you picture Oregon Coast cuisine? Sure, comfort classics like steaming bowls of clam chowder, crispy fish and chips, and ocean-fresh crab, right? What about chic wine bars, hip distilleries and gourmet markets to fill your picnic basket? The colorfully distinct North Coast towns of Astoria, Warrenton, Seaside and Cannon Beach serve it all up, from traditional classics to inventive fare, and everything in between. Kickstart your day with breakfast or recharge with a filling lunch at one of these cafes. Blue Scorcher Brewery & Café in Astoria offers beautiful scratch-made breads and pastries, and breakfast and lunch with local ingredients — and it seals the deal with a kid’s play area. Osprey Café in Seaside, a popular breakfast and lunch spot known for its Pacific Rim-inspired specials, plans to add weekend dinners soon. Recently, its reservation-only sushi events have been a smash hit with the locals. Cannon Beach also brims with quaint cafes, among them Sweet Basil’s Café with its inventive Cajun and Creole fare, and Sea Level Bakery + Coffee with house-made breads and pastries, soups and sandwiches, and the best mochas in town. Sometimes you crave the Oregon Coast classics. Astoria is welcoming a new Mo’s Restaurant in June on the Columbia River, adding to its seven other locations in the state. 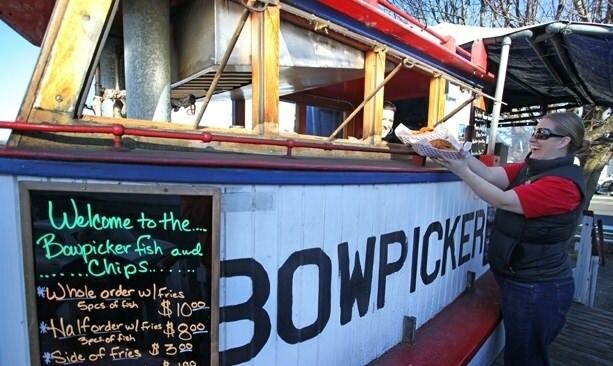 And Bowpicker Fish & Chips lures in repeat customers with its beer-battered Albacore tuna and steak fries. Doogers Seafood and Grill in Seaside (with another location in Warrenton) is known for its huge portions, four types of fish and chips, and chowder so delicious they sell kits to go. Follow the Seaside locals to Sea Breeze, a no-frills restaurant on Highway 101 (just north of the HWY 26 Junction) that serves up rich clam chowder, hearty halibut and chips, and what many insist is one of the best breakfasts on the Oregon Coast. After starting in Cannon Beach, Tom’s Fish & Chips recently opened a second location in Seaside. Tom’s fans rave about the crispy prawns and chips, clams and chips, and Caesar salad with blackened salmon. Have your pick of fish — from halibut to Pacific cod — at Ecola Seafoods Restaurant & Market, which has an extensive menu dedicated just to fish and chips. It’s Oregon, so you’ll find craft breweries galore. In Astoria, Fort George Brewery + Public House, with its expansive river views and craft beer, serves up tasty wood-fired pizza, fish and chips, and burgers. This town also has several other great pubs, including: Rogue Ales Public House, a riverside outpost of one of the oldest-operating craft breweries in the state, and Buoy Beer Co., which has views of the shipping channel and four big windows in the floor to watch barking sea lions beneath the building. 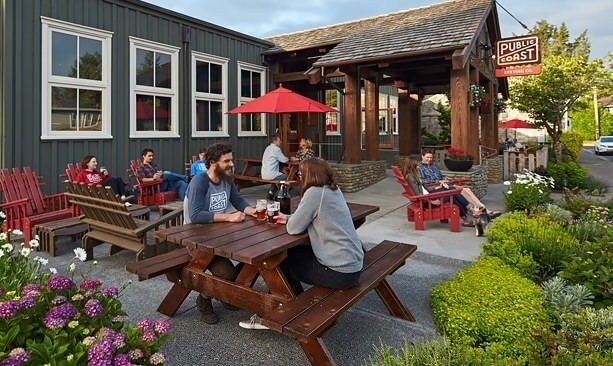 At Seaside Brewing Company, located in a century-old former city jail, relax by the patio fire pit and enjoy craft beer, fish tacos, pizza and their popular crab rolls. You can also browse a wide array of historic photos placed on walls throughout the two-story structure. Cannon Beach boasts two new brewpubs: Public Coast Brewing Co. and Pelican Brewing Company. The latter features 20 craft beers as well as flatbreads, seafood and Oregon-grown beef burgers. 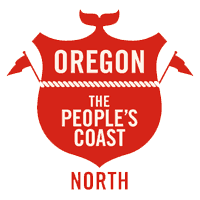 Public Coast — named for all 363 miles of the Oregon Coast open to all — serves up organic burgers and housemade brats alongside its own crafted beer and root beer. The best seafood served on the North Coast doesn’t always come in a crab-shack or dockside setting. Astoria’s Bridgewater Bistro features beautiful river and bridge views alongside its fresh seafood and impressive wine and brunch selection. T. Paul’s Supper Club is popular for its eclectic Northwest seafood menu, as well as pasta, burgers and salads.. In Seaside, Norma’s Seafood & Steak has been the go-to restaurant for more than 40 years for choice steaks, fresh seafood, tasty clam chowder and homemade desserts. Nearby and with an oceanfront view, Maggie’s on the Prom doesn’t disappoint with breakfast, lunch and dinner serving frittatas, local crab, steaks, salads and burgers. Irish Table in Cannon Beach, with its intimate setting and pub feel, serves Northwest fare with an Irish twist such as potato-kale soup and its lauded Irish lamb stew, along with steak and local seafood. The nearby Stephanie Inn Dining Room offers seasonal, locally inspired cuisine, with an impressive wine and cocktail selection — better yet, it’s a few paces from the beach for a post-dinner stroll. Planning a romantic getaway or packing a classy picnic? You’ll find it here. The Cellar on 10th in Astoria sells more than 3,500 wine selections as well as pretty gift baskets, artisan cheeses and snacks. 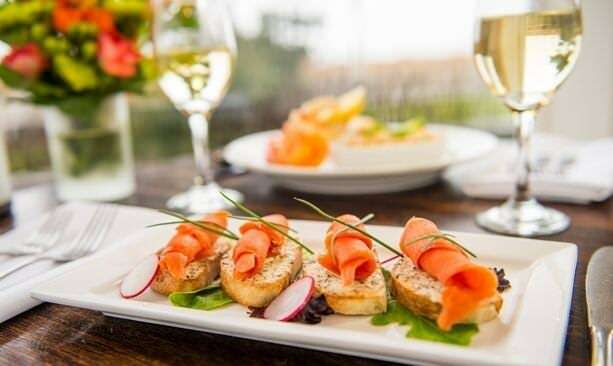 Nearby WineKraft is a relaxed wine bar with a great vino selection, cheese plate and river views. In Seaside, Buddha Kat Wine Bar offers its own varietal and fruit wines from the grapes and fruit of the Columbia and Willamette valleys and the Columbia Gorge. Hood River-based Naked Winery recently opened a tasting room in Seaside, where you can try a flight and purchase bottles of Pacific Northwest wine. In Cannon Beach, the new Fresh Foods market brims with a full deli, organic produce, and a huge wine and beer section. Provisions 124 is expanding its cured meats and artisan cheeses to also offer paninis, wraps and salads, as well as a full wine bar. Cannon Beach Smokehouse, with housed-smoked meat and fish and a full bar, plans to open in June. And Cannon Beach Distillery, known for its single-batch spirits that sell out within hours of release, is opening a new tasting room amidst galleries, cafes and quaint shops.